Can be bought from Cash Shop with 1.500 V-Bucks. The TomatoHead is the name of one of the epic outfits for the game Fortnite Battle Royale. Outfits change the appearance of the player, but do not have any added function or benefit except for aesthetical. Once the challenges are completed, the crown style for Tomatohead skin will be unlocked for use. This TomatoHead outfit is a part of Pizza Pit Set. Purchasing the item also comes with the Epic Special Delivery Back bling. There is 6 cosmetics item in the Pizza Pit set, check the list below to see which items are included. This outfit can be purchased in the Item Shop during its rotation. Part of the Pizza Pit set. 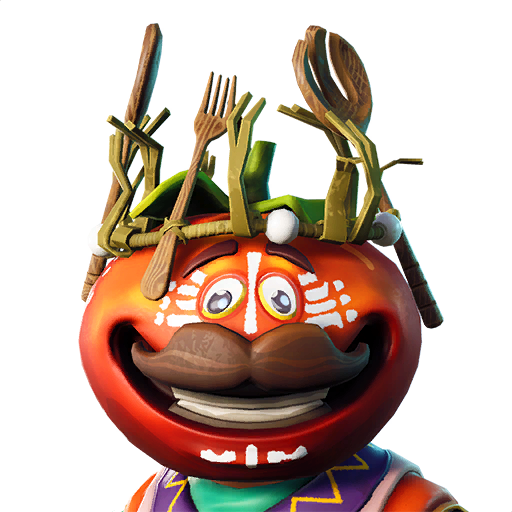 TomatoHead high-quality PNG images with transparent background to use them as you wish (YouTube thumbnails, skin concept and so on). TomatoHead rotation history in the Fortnite Shop. Below you can see the first and last time when TomatoHead could be bought from Item Shop, also how many days it was seen and the dates list. This cosmetic item can be re-added in the future, so check the store regularly. you can now customize him. Please bring it back for a rotation! Plz! It’s my Daddy! I love him! This is my Daddy! I love him! When it’s gonna be available again. I really want to have this please…. what is the CID code in the files? I despise this skin. Hope it gets vaulted! When is tomato head coming back?